Hybrid Porous Solids (e.g. 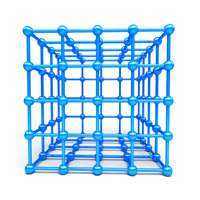 MOFs, ZIFs) Several classes of new hybrid porous solids such as metal-organic framework materials (MOFs) , zeolitic imidazolate frameworks (ZIFs) as well as so-called covalent organic frameworks (COFs) have attracted a lot of attention during recent years. These novel nanomaterials are candidates for many applications due to their chemical versatility and distinctive adsorption properties. Potential applications range from catalysis, drug delivery, separation and gas storage. For instance, micro- and mesoporous MOFs show high adsorption capacities for CH4, CO2 and H2 at high pressures. In order to increase the uptake of H2 and CO2 by physisorption at ambient pressure, adsorbents with small micropores as well as high specific surface areas and micropore volumes are required. Microporous MOFs seem to be more appropriate for gas mixture separation by physisorption than mesoporous materials. Particularly important are the interactions between the fluid adsorptive and “open metal sites” (coordinatively unsaturated binding sites). Despite the fact that hybrid porous materials are crystalline samples,various factors can contribute to deviations from perfect crystalline structure. For example, reduced pore volumes can be due to nonvolatile reactants in the pores, partial collapse, and/or other activation related problems. Hence, an advanced physical adsorption characterization via (preferably) argon and nitrogen adsorption at their boiling tempertatures (e.g. 87 K and 77 K, respectively) is a key-technique and crucial for accurately assessing the effective pore sizes, pore size distribution, pore volumes and apparent surface areas of MOFs, ZIFs and COFs) . A full characterization of these materials with regard to gas storage and separation applications requires in addition to perform CO2, CH4 and H2 adsorption experiments over a wide range of pressures and temperatures (i.e. sub-and supercritical adsorption). Adsorption experiments at various temperatures allow one also to obtain the isosteric heat of adsorption which can be correlated with the effective affinity of the adsorptive for adsorption sites(e.g. “open metal sites”) in MOFs and other hybrid porous materials.